INTRODUCTION-Our study was aimed at demonstrating that two laparoscopic methods, complete laparoscopy (LAP) and hand-assisted laparoscopy (HAL) are acceptable techniques for sigmoid resection in patients with complicated diverticulitis as compared to open surgery (OS). METHODS AND PROCEDURES- A retrospective review of 88 patients with complicated diverticulitis diagnosed between February 2003 and August 2007, were divided into 3 groups, HAL(28), LAP(35), and OS(25). Each technique was performed by a colorectal surgeon who specialized in that particular technique. The inclusion criteria specified that all patients in the study should have documentation of abscess, phlegmon, microperforation, perforation, stricture, or fistula on computed tomography. The exclusion criteria included signs of sepsis, generalized peritonitis, or hemodynamic instability. RESULTS- In our comparison of OS, HAL, and LAP, the OS technique was used as the standard. The patients in the OS group were significantly older than those in the LAP group (p=0.036). In the LAP group it was of statistical significance that BMI was greater than that of the OS group (30.37 vs 26.3). The American Society of Anesthesiologists (ASA) score demonstrated that the LAP group had more debilitated patients, (LAP- 21 ASA II, 12 ASA III, HAL- 24 ASA II, 4 ASA III, OS- 2 ASA I, 23 ASA II). The laparoscopic outcomes were encouraging when compared with open, boasting a statistically significant shorter length of stay (p=0.000436-LAP, 0.0063- HAL) and a comparable complication profile. The LAP group had only 6 complications (wound infection, prolonged ileus, anemia requiring transfusion, anastomotic stricture, and incisional hernias (2)). The HAL group noted prolonged ileus (2), PE/DVT, wound hematoma, rectal bleeding, wound infection (2), incontinence and Clostridium Difficile infection. The OS group shared similar complications which included, enterocutaneous fistula, chronic diarrhea (3), wound infection, incisional hernia (2) and constipation. 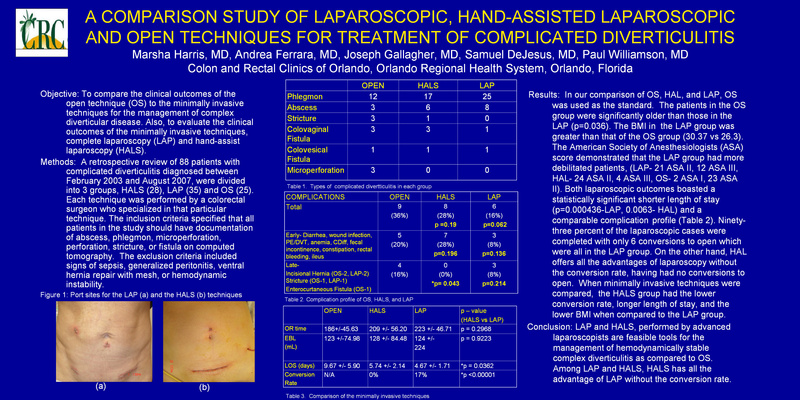 Ninety-three percent of the laparoscopic cases were completed with only 6 conversions to open which were all in the LAP group. On the other hand, HAL offers all the advantage of laparoscopy without the conversion rate, having had no conversions to open. CONCLUSIONS- LAP and HAL, performed by advanced laparoscopist are comparable tools for treatment of hemodynamically stable complicated diverticulitis. In our limited study they are as safe as OS and the length of stay is reduced with both techniques. Moreover, HAL provides lower conversion rate.